Some people underestimate the value of planning ahead, but failure to think out a lighting plan can lead to frustration or even disaster. Better safe than sorry! First, decide on the area you want to cover: roof outlines, awnings, porch, patio, trees, etc. Consider the location of your outlets and other power supplies around your house, and adjust your plan accordingly. Next, measure all of these surfaces and calculate the minimum amount of light string length needed in order to cover that area. If need be, measure the amount of electrical cord length needed as well. You will want to add some slack to your calculations, a few extra feet to cover any missed obstructions & allow some room to work with. Finally, test your lights. It is better to catch any problems with your lights before they are hung to a wall or roof. You also will want to calculate the electrical needs of your lights. Although most lights can be strung together, there is a limit as to how many can be on a single circuit before causing electrical issues. The type of light you are going to hang also matters. Mini lights and icicle lights are popular lights to hang outdoors. 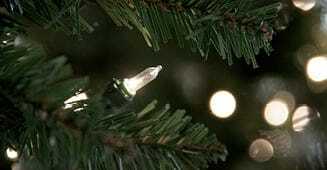 Novelty or shaped lights, which come on shorter strings, are not recommended since you would need to connect a large amount of these types of lights together, increasing the likelihood of a wattage issue. The lights we sell provide information about the wattage of strings and give an advised limit for single circuits of lights. Make sure you have all the Christmas lights you need. If you need a ladder to reach some of the hanging, you may also want to consider a bucket or similar container to hold the lights in so you can keep your hands free. You also will want nails or clips to secure the lights. For safety reasons, lights are best hung at daytime during clear weather. The most common way to hang lights are along the lines of the house’s roof, whether a single square or multi-level. If you are hanging standard light strands, the normal aesthetic is to keep them firmly to the line of the house, not allowing them to sag or hang low. Icicle lights, on the other hand, only need the top line to be even, so as to give a straight effect of all the hanging drops. Begin next to an outlet or where an extension cord will be secured. It is recommended to begin from the higher points of the house and move downward as you go. Make sure to have at least one person assisting or spotting you for maximum safety. Avoid putting anything through the wires. Instead, either attach wire clips or carefully drape the lights over nails or other protrusions so as to not cause damage to the lights. What is the standard amount of mini lights to put on a well lit tree? We suggest using a 100-light set per foot of your Christmas tree. So if you have a 7-foot tree, we recommend buying seven (7) 100-light sets. The biggest thing to remember when putting lights on a Christmas tree is how bright you want it to look. If you are using LED lights, you will want to use fewer lights as these lights can be more intense and are better suited for outdoor use. Warm white LED lights work best on your Christmas tree. Whether you want to put clear lights, multi lights, or LED lights on your Christmas tree, our wide selection of lights make it easy to find what you are looking for. Or you can always just buy one of our pre-lit artificial Christmas trees and not have to worry about putting the lights on your tree year after year!